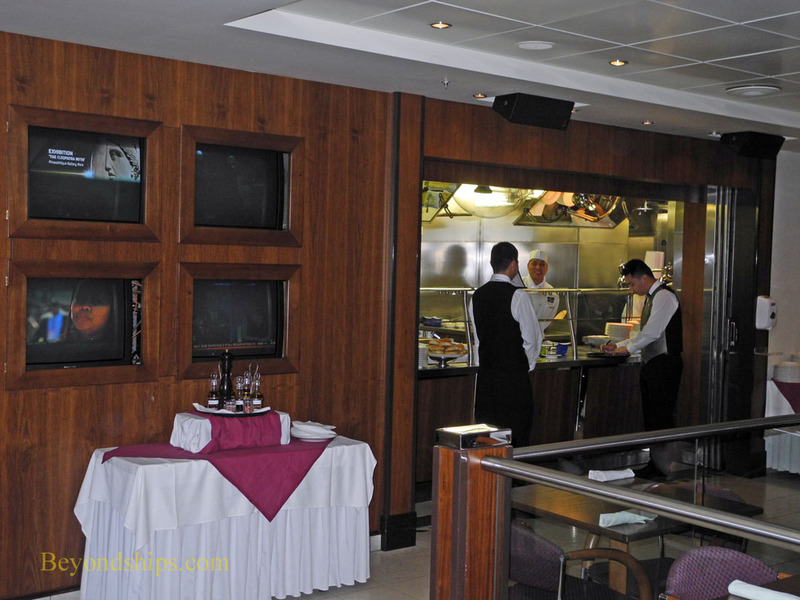 The King's Court buffet restaurant on Queen Mary 2 is not one giant room as on many cruise ships. Rather, it is divided into several areas that are physically separate from each other. In the evenings, only one of these areas remains a self-service buffet restaurant. The others are used as alternative informal dining venues. One of these areas, the Chef's Galley, has become a “pizza and pasta station.” It is not a traditional shipboard pizzeria where you order a slice or two from whatever pizza has recently been baked. Rather, it is a gourmet pizza venue where an individual-size pie is cooked for each customer as ordered. The concept is similar to Alfredo's Pizzeria on the Princess Cruises ships. Each night, the Chef's Galley features a different specialty pizza. However, your choice is not limited to the pizza of the day. 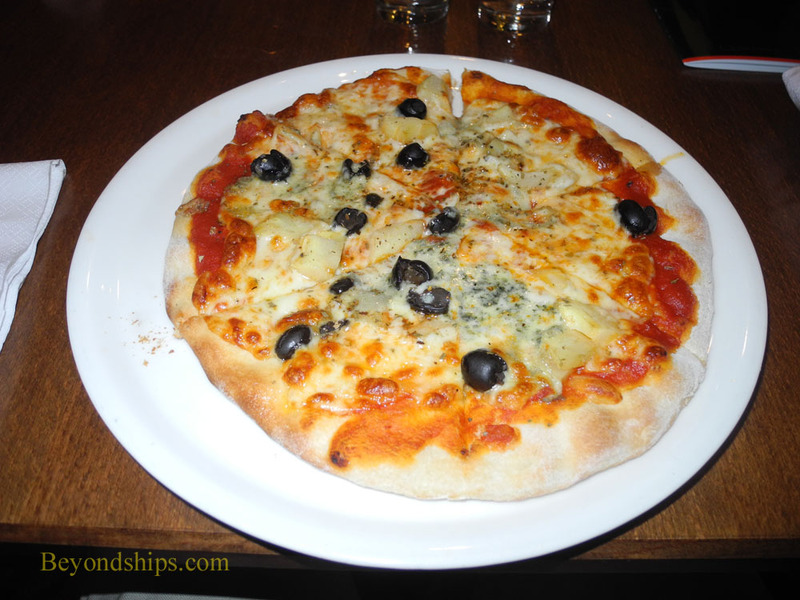 Instead, you can order popular pies such as Margherita pizza or Hawaiian pizza. In addition, you can design your own pizza utilizing a wide variety of toppings and sauces. It takes about ten minutes from the time you place your order until the pizza arrives at your table. Since it has just come from the oven, the pizza is warm and tender. You can also taste the freshness of the ingredients. The crusts are not thick but not as thin as at some gourmet pizza venues. 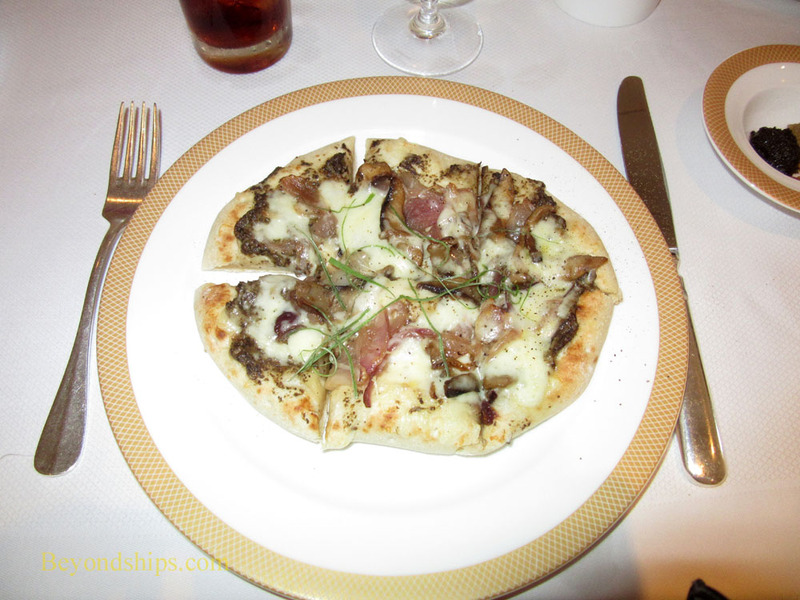 Overall, the basic pizza is less spicy than the ones served at Alfredo's but that is not suprising considering that QM2 has to cater to the tastes of a more diverse international clientele. You do not have to have pizza at the Chef's Galley. There is also a daily specialty pasta offering. 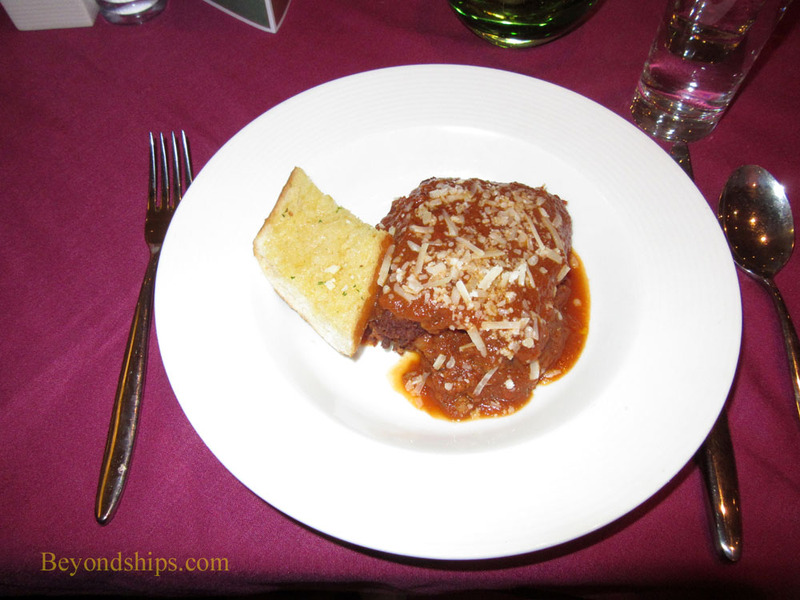 In addition, the restaurant offers familiar favorites such as beef lasagna, which we found to be quite good - - flavorful and not overcooked. The Chef's Galley features waiter service in the evenings. You sit down at one of the tables and a waiter comes and takes your order. He also brings the food to the table. Each time we visited the Chef's Galley, the service was cheerful and prompt. The room itself is not very big. It was originally a demonstration kitchen area where guests seated at tables on a raised platform could watch chefs prepare various dishes. That concept has since been abandoned but you still can see into the kitchen area from most of the tables. Nonetheless, it has a nice atmosphere with subdued lighting and small candles burning at each table. There is no cover charge for the pizza and pasta station in the Chef's Galley. It should be noted that QM2 also has traditional pizza by the slice during the day. That pizza is offered in a different section of the King's Court. In addition, the Todd English specialty restaurant offers excellent pizza-like flat bread as an appetizer on both its lunch and dinner menus.